That house is gorgeous--wow! Talk about inspirational! I think my favorite part is how she framed illustrated book pages. So creative when done right with a beautiful frame like those in that foyer... not ripped out and glued on construction paper like I did in my bedroom in high school! I also want to take a minute to and say THANK YOU (so much) to everyone who voted on my "black tie optional" outfit! You really are a great bunch to humor me with this! The vote to yes, wear the outfit I put together vs. a more traditional black tie dress was the clear winner so I am going to brave it. And you betta believe that I'll share the pics to prove it. GAH. I am just itching for some time with my "gogh" girls. It's been too long! So on to something really pretty. The other evening my mom had some dear friends from her former job at a library over for their annual reunion dinner. I can tell it's definitely one of her favorite nights of the year and she usually does something a little special. This year she sent me a picture of the centerpiece she made and I just had to share it with you! Greenery from the yard. 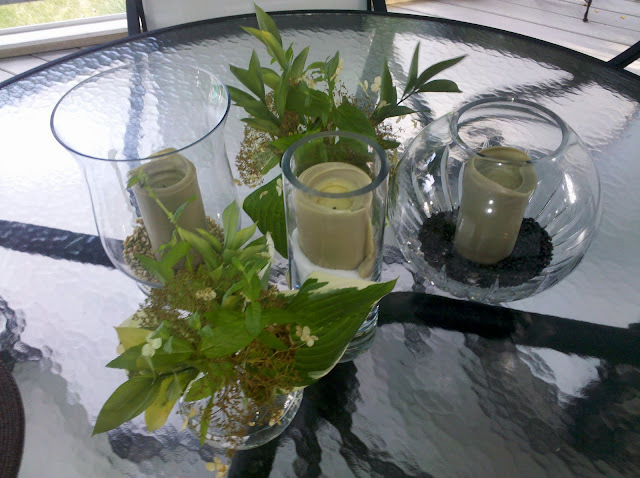 It is a mixture of hosta, lace hydrangea, magnolia leaves and mint. Vases she had lying around the house (*well, except for one vase from HomeGoods for $5.99! That she'll "definitely use again".) I love how the mismatched heights and shapes to keep it interesting but since they are all glass it still feels simple and modern. She anchored the candles with items from the kitchen: one vase has dried split peas, one has black beans and and the last one has sea salt. Isn't that great? Go Momma! My whole life my mom has been creating really beautiful tables for our holiday dinners and even our birthday dinners. Over the past couple of years I have earned the responsibility of dressing the table with her linens, etc, on Thanksgiving. The first couple of tries took me forever! I could never decide what to choose, but now I finally feel like I might be learning the ropes. We'll see how it goes this holiday season. You know I'll tell you all about it! PS: I want to see this movie (watch the trailer!). Anyone wanna go with me? omg. i am looking up movie times as i type. when can we go.